Ron wanted to see if he could transform the new kit into a Ranchero. 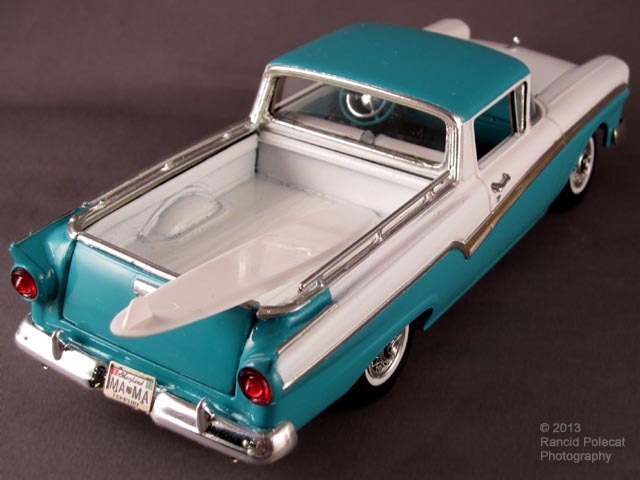 Using bits and pieces from the original Revell Ranchero kit (first released in 1960 and derived from the 1957 Country Squire Station Wagon kit released in 1957) and scratchbuilt parts along with wheels and a surfboard from his parts box, Ron acheived his goal. Paint is Testors Classic White and Tropical Turquoise lacquer.